This unscheduled maintenance activity was prompted when Sarah, of the Aggie Outdoor Volunteers at Utah State University, called to see if their group could help us. Sarah knew the Cache Hikers had adopted the Crimson Trail, but we decided a relatively large group of inexperienced workers could make good progress removing invasive weeds on the River Trail. Burdock plants along this trail have gone to seed, but they could be bagged and hauled out since the burs are still attached to the stalks. Houndstongue plants matured earlier in the summer, but many of these still had burs to bag and haul out. 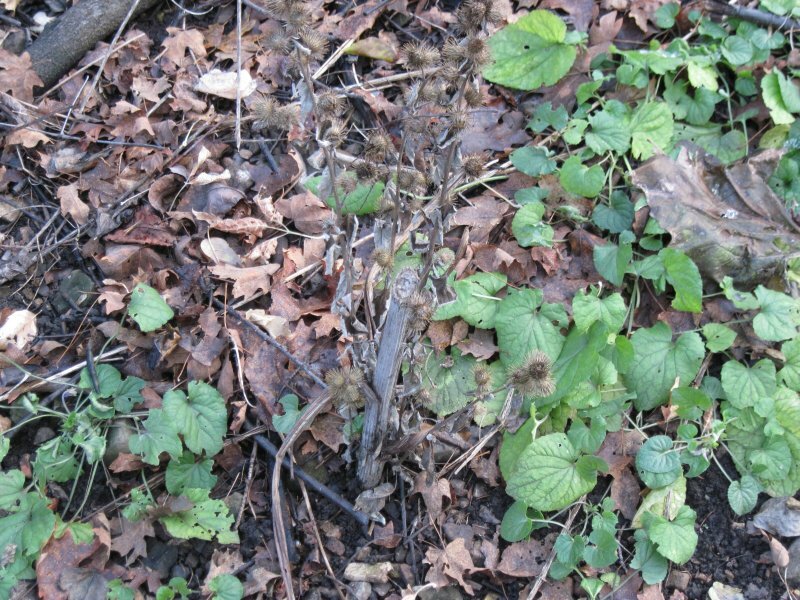 First-year burdock and houndstongue plants also could be removed, greatly improving the weed situation for next year. Eleven volunteers met at 9:00 on the USU campus: Dave W and Jane of the Cache Hikers, with USU students Austin, Brennan, Derek, Jeremiah, Kevin, Carson, Chasen, Sam and Sarah. We distributed information about these invasive trail weeds, discussed weeding methods and tool safety, then carpooled to the Red Bridge on the Logan River. Tools, work gloves and garbage bags were distributed - six people had pick-mattocks for weeding first-year plants and the others had hand pruners and garbage bags for the ripe burs. After practicing our technique on burdock at Red Bridge parking area (and filling two garbage bags), we continued weeding as we moved up the River Trail. There were a lot of weeds along the trail but we made deliberate progress, chopping out first-year plants and bagging burs (and learning how annoying it is to get burs on clothing and in hair). Three people had to leave early, so they headed back to Red Bridge, carrying bags of weeds with them. The rest continued working up the trail, finally reaching the bridge at Second Dam about 1:30. We put our garbage bags in the dumpster and ate lunch while trying to ignore the burdock infestation all around the picnic area. After lunch we went back to Red Bridge, dropped off our remaining bur bags in the dumpster at the Logan Ranger Station and returned to USU about 2:30. 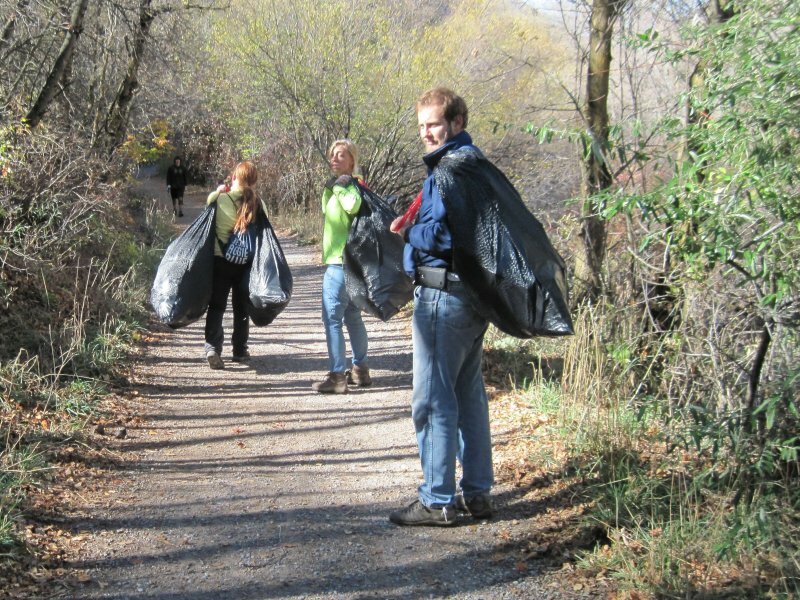 On November 11 Sarah's group joined us in another effort to remove invasive plants from the river trail. Sarah, Dylan and Nate met Dave W. on campus, and Jane joined us on the trail. We picked up where we stopped on October 24, removing houndstongue and burdock from along the River Trail from Second Dam to the trail switchbacks, another 0.4 trail miles. During the summer someone had chopped the tops off many of the burdock plants along this section, but they have re-grown flowers and produced burs below the cut.